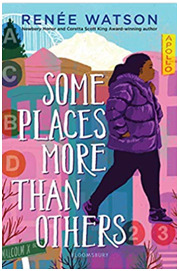 From Newbery Honor- and Coretta Scott King Author Award-winning, New York Times bestselling author Renée Watson comes a heartwarming and inspiring middle-grade novel about finding deep roots and exploring the past, the present, and the places that make us who we are. All Amara wants for her birthday is to visit her father's family in New York City--Harlem, to be exact. She can't wait to finally meet her Grandpa Earl and cousins in person, and to stay in the brownstone where her father grew up. Maybe this will help her understand her family--and herself--in new way. But New York City is not exactly what Amara thought it would be. It's crowded, with confusing subways, suffocating sidewalks, and her father is too busy with work to spend time with her and too angry to spend time with Grandpa Earl. As she explores, asks questions, and learns more and more about Harlem and about her father and his family history, she realizes how, in some ways more than others, she connects with him, her home, and her family. RENÉE WATSON is the Newbery Honor and Coretta Scott King Author Award-winning author of the novels Piecing Me Together, This Side of Home, What Momma Left Me, Betty Before X, co-written with Ilyasah Shabazz, and two picture books: Harlem's Little Blackbird and A Place Where Hurricanes Happen. Renée is the founder of I, Too, Arts Collective, a nonprofit committed to nurturing underrepresented voices in the creative arts. She lives in New York City.